Now that I’ve made Mike Avery’s Sourdough Bagels a few times over, (below is my slightly modified version of that recipe) I’m very happy with the results. These sourdough bagels are coming out nice and golden with a dense and slightly chewy crumb, a good crust and terrific flavour. I’ve done one round of the Bagel recipe from Peter Reinhart’s The Bread Baker’s Apprentice as well and although they came out looking great and tasting very nice indeed, I found I was missing the interesting flavour tones that the sourdough gave when using the Mike Avery recipe. It was also good to give a try to a recipe that many people have used and to make a definite comparison. The hands down winner is (are?) the Sourdough Bagels. So here then is the (slightly modified) recipe for Mike Avery’s Sourdough Bagels. 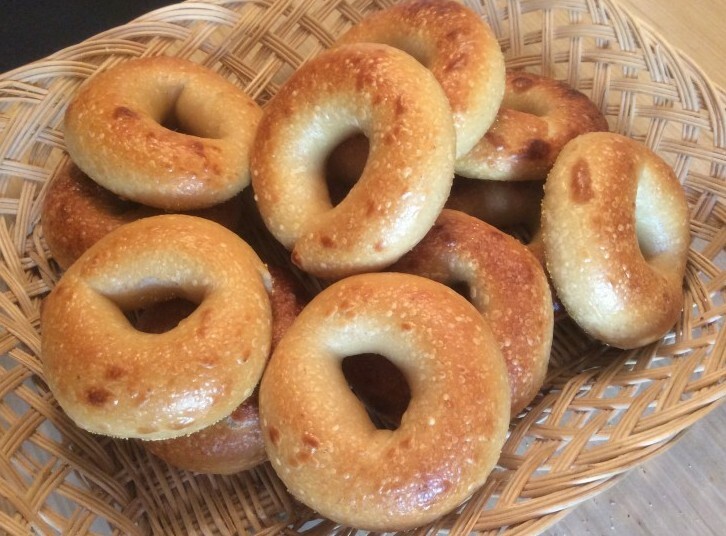 I’ve modified the amounts since his recipe, as he states on his web page, was designed for a class and therefore makes only four bagels… hardly enough to make a run at home when that would only last maybe a day, if you are lucky! So I bumped it up in increments to a more useful 12 bagel size. This would then be enough to bake on two normal sized home baking sheet (6 per sheet with a fair bit of elbow room) in a home oven and last you and a friend more than just a day or so. (We normally freeze six, they still taste just fine after thawing.) I also included the Baker’s percentages so those who use these can modify the recipe easily to make any size batch. This also tells us that the formula is 50% hydration so it is indeed a very stiff dough. Where do I get High Protein Bread Flour? High Protein Bread Flour, which has a 14% gluten protein rating compared to 12% for bread flour and 10% for All Purpose (in the US; Canadian All purpose is 11.5 to 12%), can be found through mail order, specialty or natural food markets. US residents can get “Sir Lancelot” High Protein Flour from King Arthur Flour either online or may have a store that carries it nearby. If high protein flour is just not available, an alternative is to use the highest protein content flour you can find regularly (i.e. unbleached bread flour) and 6% in Vital Wheat Gluten (VWG) powder to increase the gluten content. So starting with typical bread flour at 12% protein, we can reduce the flour amount by 6% and replace that quantity back in VWG. In Canada, I’ve found Vital Wheat Gluten in the local big grocery store’s Organic Foods section along with the Bob’s Red Mill products, but I’ve also found it at Bulk Barn. If you simply cannot get or concoct High Gluten Bread Flour, you can still use a good unbleached bread flour; the bagel texture will be just a little different but still incredibly better than any grocery store bagel you’re ever eaten. Where to get Malt Powder and why do I need it anyway? Check out you local Brew It Yourself shop, as malt is used in beer making. It may be available in powder and/or syrup form. You might also find it in a natural food store, although I found it highly overpriced there. A 500 ml tub of light malt at the beer maker (c. 2009 in Canada) was $2.50, while a 360 ml jar at the natural food place was $9.95. If you get the syrup form (it’s like honey) just add a gram more than the powder malt for each bagel. Why do you need malt powder? It helps give the bagels a shiny, rich golden brown colour when baked, the sugars help feed the yeast culture and it add a specific flavour to the finished bagels. You can do without but your bagels will be paler, take longer to proof and taste a little less authentic. You can use honey instead although this will, clearly, change the taste. Mix all the ingredients above in a large bowl until relatively well incorporated. 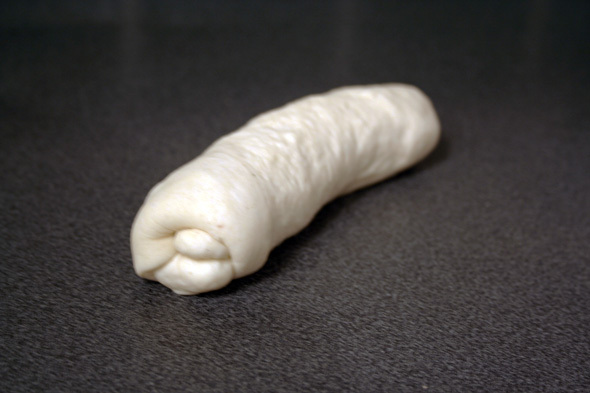 The dough does not need to be perfectly smooth (yet), as long as almost all the flour is mixed in; a small amount of dry flour remaining is fine. Now turn the dough out onto your dry, bare counter – no need to add any flour as this is already stiff dough and won’t stick. 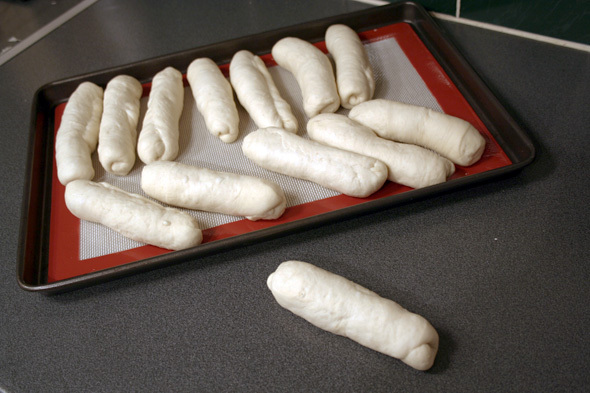 Work any last bits of the dry flour into the dough. 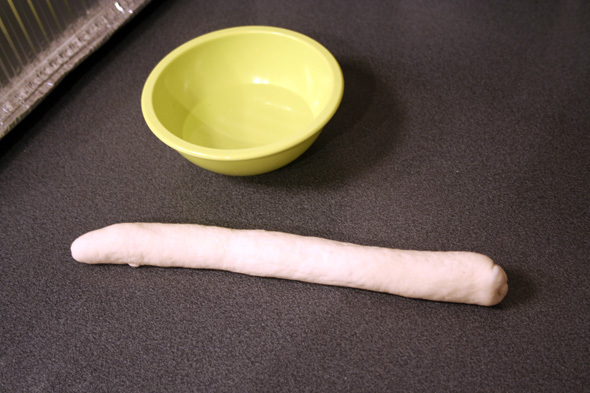 Cover with the bowl and rest the dough for 5 – 10 minutes of autolyse. Once rested, begin to knead until the dough is smooth and velvety. Use your bench scraper to help gather any stray bits of dough and keep things in one ball. The kneading will take about 10 – 15 minutes or so. Feel free to take a 5 minute break during the kneading; the dough, covered and allowed to rest as well, will be easier to keep kneading when the gluten has relaxed. Check if you can successfully do the windowpane test and knead for 5 minutes more if you can’t. Check again; once it passes, it’s ready to bulk proof. I’ll add that this method is now my preferred way to mix these. Yes, it’s a bit more manual labour but not a whole lot, especially when I take a couple of 5 minute breaks to let my usual 12-bagel sized dough relax, and it saves a possible breakdown of my poor little mixer. However, if I were to be making these at the bakery in larger sized batches, I’d definitely be using a big, powerful mixer instead. NOTICE: Be forewarned that bagel dough is VERY STIFF at about 50% hydration and will be a definite workout for your home mixer and may even burn out the motor. The batches given above in the green columns (4 and 6 bagels) should be OK for your standard KitchenAid mixer; the ones in red (8 or 12 bagels) are pushing the limit. Pay close attention and give the mixer time to cool down before starting again. If you don’t allow the motor to cool down after 5 minutes of mixing, you may also burn out your gears. It may be wiser to make two half-size batches instead. If your mixer is straining, pausing, starts to smell like it’s overheating or is getting hot to the touch, STOP. Alternatively, you may want to mix by hand for the larger amounts; yes it can be done and has been for eons before stand mixers were invented. It is simply not worth burning out a $200+ machine to make a dozen bagels. Go the old fashioned route and save your mixer. You’ll then be able to really say “I made these by hand”. First, at low speed (1 on a Kitchenaid) use the dough hook attachment to mix all of the ingredients together roughly for a minute or two until pretty much no dry flour remains; you may need to stop the machine and get at the dry flour at the bottom with a spatula or bowl scraper. Once you have a rough mass, increase to speed 2 and knead the dough for five minutes. 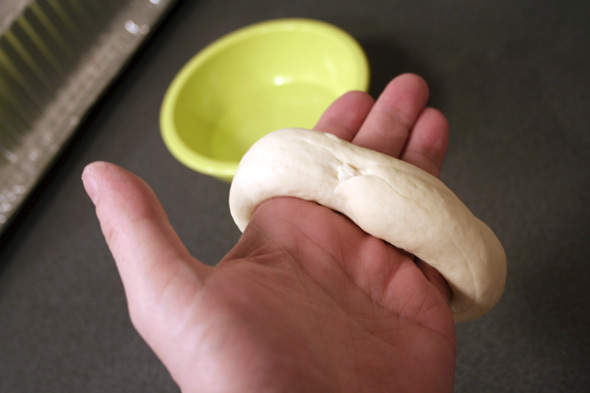 Pull this dough off the hook and let it rest, covered, for it’s 5 to 10 minute autolyse rest. This pause also lets your machine cool down as it will likely have strained a fair bit. After the autolyse rest, knead the dough for another 5 to 10 minutes. Check at the 5 minute mark to see if it passes the windowpane test and if not, knead for another 5 minutes or until it is smooth and passes the test. Touch your machine’s motor area to see if it’s overheating; if it is, stop! and let it cool down before continuing. The rest won’t harm your dough, just cover it with some cling film to keep it from drying; think of it as an extra little autolyse. If you are doing two half-batches, repeat the above for your second half then combine the two mixed doughs at this point by hand kneading for a few seconds. Allow the dough to rise, covered, for about 2 hours (I just flip the mixing bowl over it). The dough is so dense that it probably won’t visibly rise much. 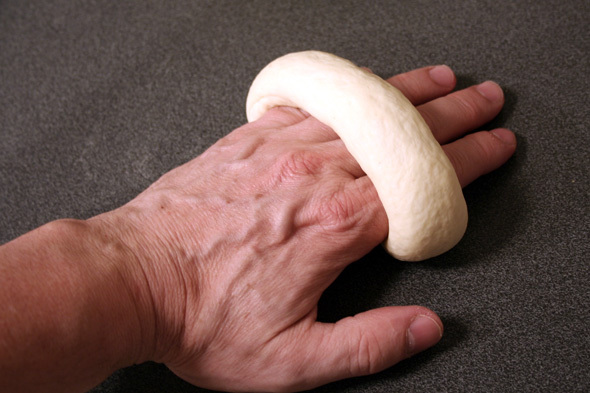 You may proceed when the dough will not spring back when gently poked. Do a poke at about one hour to see what “not ready” is like: you’ll see it indent then refill the poke rather quickly. At about 2 hours, you’ll poke and it will pretty much stay as is. Cut the dough into the expected number of pieces that are more or less the same size. The recipe given above gives you about 125 grams (4.4 oz) per bagel. 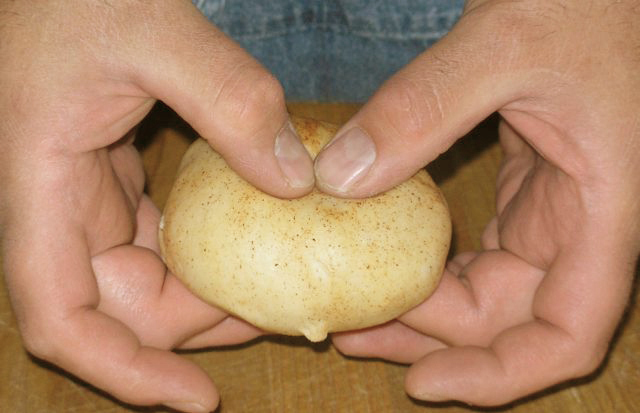 An easy way is to make a ball and start cutting it in halves, then quarters, etc. until you have the desired number of pieces. Keep the dough ball and pieces covered with a barely damp cloth while you form the bagels. 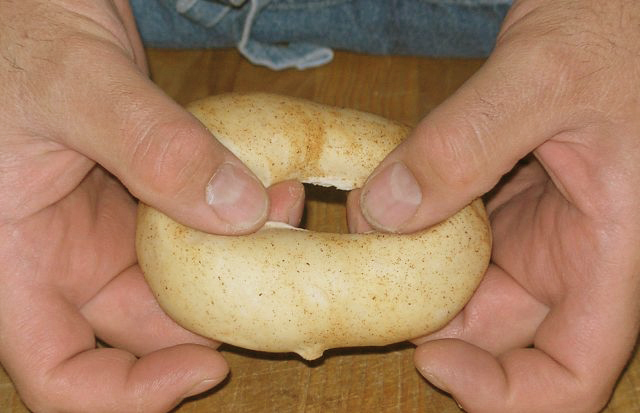 There are two main ways to shape bagels: balls or rope. One way is to roll the dough into a ball, poke a hole in the center of the ball and then stretch the ball into the doughnut shape we all know and love. The second way is the more traditional way. Take your pre-weighed chunk of dough and flatten it into a small rectangle. Roll this little sheet into a stubby cigar shape, don’t taper the ends. Repeat for the rest of the dough chunks. 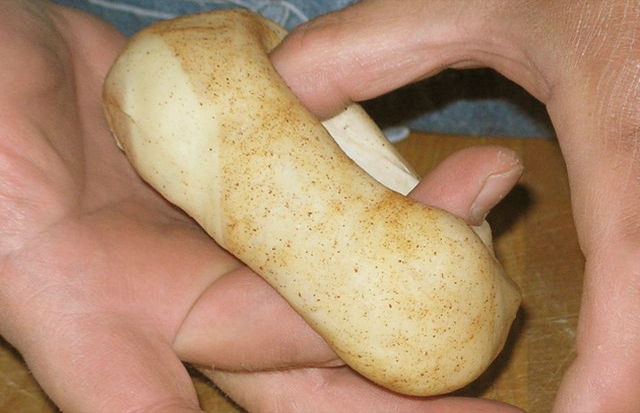 Roll a stubby piece starting from the center and moving your hands outward to stretch it to a rope about 10 inches long (25 cm). Wrap the rope around your hand overlapping the ends at your palm by about 1 or 2 inches (2.5 – 5 cm). Wet the end a little if the dough is too dry. Now press the ends together rolling the dough back and forth so they seal well. This doe NOT have to be perfectly smooth – you’re not a bagel extruding machine. And voila, a finished rope-style bagel. Both methods work. Poking is easier, but it’s also easy to stretch the bagel dough too far. 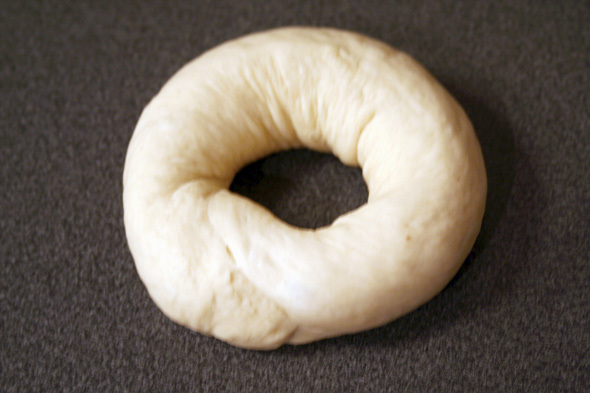 The rope can make a bagel with a more consistent size, but it can lead to not sealing the seam well enough and have the bagel come apart. I prefer the rope style, keeping a clean damp cloth near by to dab the rope ends on if needed. If you don’t stretch the bagels far enough, they’ll be too tall/fat to fit in a standard toaster. Whether poked or roped, the hole should be about 2″ in diameter when you have just finished shaping. This may seem big but the hole will get smaller as the bagel rests and when it rises in the boiling and baking stages. You may want to shape them (whichever method you pick), place the on the baking sheet then after a minute or three resting while you roll out more, give them a little bit of a stretch again. This will help ensure they don’t contract into small pucks. Once the bagels are formed, put them on a baking sheet that has been covered with bakers parchment, spray them with some oil, and cover them with plastic film. You’ll want to make sure any dough you’re not busy shaping is kept under wrap, whether at the raw balls, ropes or the shaped bagels. If you make an error while shaping a bagel, roll it back to a ball or rope as best you can, put it back on the tray and let it rest, covered, about 3-5 minutes while you work on the remaining pieces; this rest will let it relax some and be easier to reshape. Once all your sourdough bagels are shaped, let them sit for about one or two hours. This is called “bench time” in the biz. Here you’ll check to see if they’re ready to retard or bake. After the first hour of bench time, take one of the bagels and drop it in a bowl of room temperature water. If the bagel floats within 10 seconds, you’re ready to go to the retard stage. If it doesn’t float, they need more floor time. Pull the bagel out of the water, pat it dry and put it back on the parchment to rest some more. Check the bagel again in 30 minutes. Once the test bagel can float in a few seconds, you can now retard them in the refrigerator overnight (or up to two days) and bake tomorrow. Retarding is a step that allows the sourdough to develop a lot of it’s flavour. If you want to get them going right away and pass on flavour development, you can hop right to the boiling stage below. Doing it the faster way, however, means you will miss out on a lot of the great flavour that develops in the longer overnight method. In the morning, take the bagels out of the refrigerator to warm. Place a large pot of water on to boil and set your oven to 500°F with two racks set in the middle of the oven. If you want to seed the bagels, put some poppy/sesame seeds or rehydrated onion flakes (although I find onions burn when baked) onto a plate as the water is heating. Add a tablespoon or two of malt extract, either liquid or powdered, to the water once it is boiling. Note, this is in addition to the malt extract that was included in the dough, or, there is malt extract in BOTH the dough and the boiling water. If you can’t get malt, use some brown sugar instead; it’s close enough for a second choice. Have a minute timer ready and set to one minute. Once the water/malt is at a rolling boil, put the bagels into the boiling water, flat side down; start the timer. Don’t crowd the bagels in the pot as they need room to move around and they do get bigger. Let them boil for one minute then flip them over and reset the timer to let them boil one more minute. OK, “about” one minute; you don’t need to panic if you’re over 60 seconds a bit. Some people recommend using an ice water bath next, to help chill the bagels right away and stop the chewy crust from being too thick. Try this: boil and tray the first half of the bagels, then boil, chill and tray the second half. Check to see if you can tell the difference once they’re all baked, go with whichever method you end up liking most. For plain sourdough bagels, pull the bagels out of the water with a slotted spoon and place them on a baking sheet covered with parchment paper and sprinkled with a little cornmeal or semolina. If you want seeded bagels, take the bagel out of the water and place it top side down into the plate of your chosen coating. The seed will stick to the wet bagel. Place the now coated bagel on the baking sheet as above. Repeat with the next set of bagels until all the bagels are boiled and, if desired, coated, and placed on the parchment-covered baking sheets. Put the bagels in the oven and bake at 500ºF for five minutes or so. Then rotate the baking sheets 180º so the bagels at the back are now at the front, and switch the top sheet to the lower rack and the bottom sheet to the top rack. Bake another 5 – 10 minutes or until the tops are golden brown. It may take about 15 minutes total. Aim for a nice, deep golden colour, not the pale, pasty colour you typically see on grocery store “bagels”. Just check the bottoms to make sure they’re not overbaking. Once out of the oven, place the bagels onto cooling racks and leave them be for at least 10 minutes. Resist the urge to eat one while still very warm; the dough hasn’t finished baking yet, cooling is still part of the baking and is where the starches gelatinize. Once cooled, you can slice and toast them. Smear with butter and/or your favourite topping. The original sourdough bagels recipe can be found on Mike’s SourdoughHome.com site (where the Ball & Poke pictures above came from). Be sure to check out the site for this and tons more terrific sourdough info. If you do try this recipe out, take a moment and add a comment here to let others know how it went! Well, I just completed my first batch of homemade Sourdough Bagels! I made the 6 bagel version of your recipe. The only difference in my recipe from yours, was I replaced regular flour with sprouted hard red wheat flour. They came out absolutely wonderful. 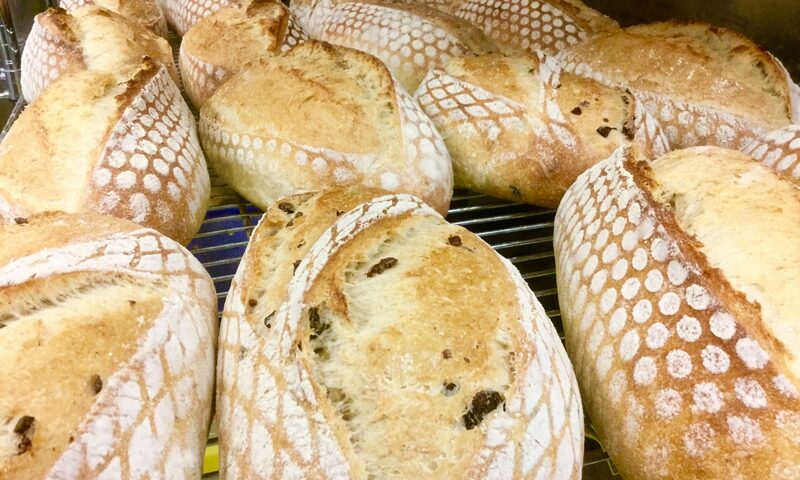 Great sourdough flavor, the texture was perfect, and everyone loved them. So, after the big failure with the Hamelman bagels, I’ll give this recipe a try! As I really LOVE bagels I’ll keep trying recipes until I find the perfect one. Maybe this is it – the pictures, at least, look good! .-= ap269’s latest blog post: Devil’s Food Cake =-. Paul, I’m about to make these bagels. My starter is ready… As I haven’t been so very successful with making bagels yet, I want to make sure I follow your guidelines to the t. So, here’s my question: when I top the bagels with seeds and place them on the baking sheet, is the seeded side on the bottom (touching the baking sheet) or on the top? Do I have to flip the bagels after a certain amount of time in the oven? .-= ap269’s latest blog post: The Daring Cooks’ Challenges 04/10: Brunswick Stew =-. Your bagels made me happy Paul! PS Tried to post this on the Mellow Bakers, but can’t post this morning for some reason. I just found your site after googling Mellow Bakers (it actually came up first before the actual Mellow Bakers site, go figure!). I’m very impressed with your blog and will be doing more reading right away. The sourdough bagels look excellent, I have a happy 100% hydr. starter that I’m excited to try with them. I’m in Burlington, ON if that helps any. Diff between the yellow “No Name” Unbleached All Purpose and Robin Hood Best for Breads (aside from the huge price difference)? The Robin Hood is bleached and bromated so it’s been chemically treated. As far as the difference between RH All Purpose & BfB: the protein levels are the same so the only difference I’ve been able to note (and I’m not privy to more than the label info and the Robin Hood website) is that BfB has had conditioners added. You may find No Name UAP suitable for most breads, I used it as is for a long time and added Vital Wheat Gluten when higher gluten levels were needed like in bagels. You can find VWG at Bulk Barn if one is near you and if not, perhaps in the Organic section of your nearby Big Name grocery store, ours carried Bob’s Red Mill in a small bag, plenty for a LOT of batches. These look great. We’re a whole grain family. Thought I’d try them with organic spelt flour with, maybe, some added gluten. Haven’t ever worked with spelt, no idea how that would change things. Whole wheat should be good as long as you don’t use 100% since bagels want a pretty high gluten content and the bran in WW tends to slice up the gluten strands. Joanna of ZebBakes.com has been playing with spelt in the last few days so you may want to check out her blog and see how she’s doing with it. Thanks for your notes, Paul. I’ll likely end up trying a combination of spelt, whole wheat and maybe a little white, with some added gluten. Your site and photos are terrific. I’ll let you know how they turn out. We’re making them to serve with cold-smoked Alaskan lox for my daughter’s 8th birthday on Saturday! I’ll be following your site’s instructions otherwise. Will keep you posted. Awesome! My first time using your recipe… I’m going with spelt, kamut, and hi-gluten flour. We’ll be serving with smoked salmon, raw homemade yogurt cheese, capers, caviar, red onions, sliced tomatoes, and goose pate for our annual New Year’s morning feast! My kids look forward to this ALL year! Thank you! Hope it goes well, I don’t really have any experience with the flours you mention so I’m interested in hearing back about the results. If it all goes well, give us a breakdown of what proportions you used so others can give it a go too! Your recipe was flawless and the bagels super-delicious. It’s impossible to buy a decent bagel around Spring Hill Fl. Thanks much. Thank you Paul for such thorough instructions. I made these bagels but I doubled the organic rye sourdough starter amount and reduced the water by the equivalent amount. I then used half spelt and half dark rye flour. I doubled the whole recipe (the 8 bagel amount), and made 16 wonderful dark rye bagels. We had them for breakfast Christmas morning and they were perfect! I’m making a new batch today but with a mix of spelt and baker’s flour (again with the rye starter). Hi Carrie, glad to hear it came out well! First, I thank you for this recipe. Today, I tried it for a second time. The first time was a bit of a messy affair due to my inability to mix the dough well. Still, the bagels were edible. Not a complete loss. Today, the bagels were better. I have found a rather funny way of mixing my dough that works. So the mixing was alright. Unfortunately, at the autolyse stage, I think that the flours I used were a bit too strong, or I had added a bit more gluten than necessary, the mixture ran out of moisture. I panicked and added a bit more water. From thereon, all went fine except at the very end when the bagels were being formed: the dough was not firm enough … obviously, as would say Snape. Anyway, I’ve made good note of that. I shall try to better monitor the hydration next time. I plan on baking those bagels every two weeks or so. Today has been a good learning experience. I have some confidence that my next batch will improve. I also should mention that because I don’t have a large refrigerator, I retard all my levain dough at the beginning, i.e. I do the bulk fermentation in the fridge overnight. The following day, I do the stretch & folds, shape, final proof, and bake. The texture of the bagels I just baked is very good. And they taste good as well. Glad to hear your bagel adventure went so well. To “give credit where credit is due”, I must add that the recipe isn’t my own, it is from Mike Avery over at SourdoughHome.com. I’m mostly just showing the steps individually here, modifying the recipe just to offer larger batch sizes, and to show the finished product from a (at the time) non-professional home baker’s viewpoint. That said, I’m about to introduce these very same bagels at the bakery in the next week or two so, based on that, you can guess I’m more than happy with these results. As I’ve noted, I have made several different formulas of bagels, some sourdough but most commercial yeasted from folks like master baker Jeffrey Hamelman to Peter Reinhart to a world famous Montreal bagel shop (St-Viateur Bagels), and these still come out best, IMHO. Now I’ll be the first to admit the St. Viateur bagels I could make at home are unlikely to be a replica of the ones from their shop – they use a specially built, bagel focused stone oven and have perfected the production techniques for this shop since 1957 – but going off their own recipe, the results I’ve had don’t quite hit the mark as nicely as these sourdough bagels. I recommend draining them on a cooling rack for a minute after boiling, but before placing them again on a corn meal dusted sheet. Doing so prevents the water from forming a hard crust of corn meal on the bottom of the bagel when you bake them. .